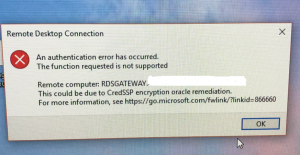 ﻿ Windows Security Update Breaks Remote Desktop Connection - Orange County Computer, Inc.
Windows Server 2016Windows Server 2012 R2 Standard Windows Server 2012 Standard Windows 8.1Windows 10Windows 7Windows 10 Version 1511Windows 10 Version 1607Windows 10 Version 1703Windows 10 version 1709Windows Server 2016Windows Server 2008 R2 Standard Windows Server 2008 Foundation Windows Server 2008 Enterprise without Hyper-V Windows Server 2008 Service Pack 2Windows Server 2008 Datacenter Windows Server 2008 for Itanium-Based Systems Windows Server 2008 Datacenter without Hyper-V Windows Server 2008 Enterprise Windows Server 2016 Standard Windows Server 2016 Essentials Windows Server 2016 Datacenter Windows Server Datacenter Core Windows Server Standard Core Windows Vista Service Pack 2Windows Server 2008 R2 Enterprise Windows Server 2008 R2 Datacenter Windows Web Server 2008 R2Windows 7 Enterprise Windows 7 Ultimate Windows 7 Starter Windows 7 Home Premium Windows 7 Professional Windows 7 Home Basic Windows Server 2008 R2 Foundation Windows Server 2008 R2 Service Pack 1Windows 7 Service Pack 1Windows Server 2012 Essentials Windows Server 2012 Datacenter Windows Server 2012 Foundation Windows Server 2012 R2 Datacenter Windows Server 2012 R2 Essentials Windows RT 8.1Windows Server 2012 R2 Foundation Windows 8.1 Pro Windows 8.1 Enterprise Windows Web Server 2008Windows Server 2008 Standard. The first phase of this update was originally released on March 13, 2018. If you receive this error message, your connection will need to be set up again. Please contact Orange County Computer, Inc. for immediate resolution at (949) 699-6619. Deborah is the Operations Director at Orange County Computer and has been with the company since 2004.